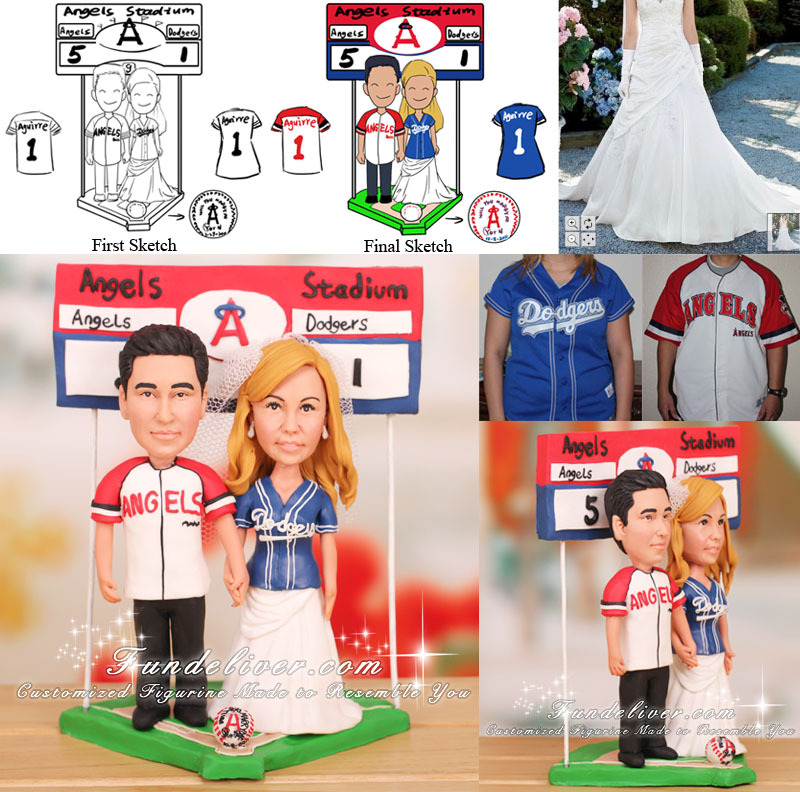 This is a completely customized Los Angeles Dodgers and Angels of Anaheim baseball wedding cake topper ordered by one of our customers. The groom is fan of Los Angeles Angels of Anaheim and the bride is a fan of Los Angeles Dodgers. 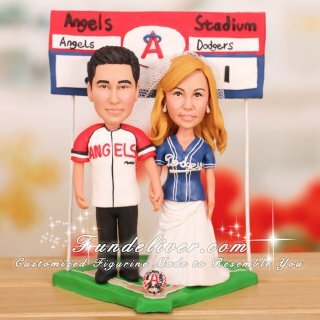 The groom made the proposal at Angels vs Dodgers game with a baseball, so they would like to get this scene incorporated in their wedding cake topper. They would like to have the groom in an Angeles jersey (MLB) with suit pants, so just the top to reflect the team, the back of the jersey to have the #1 and "Aguirre". For the bride they would like her to be in a Los Angeles Dodgers jersey over the wedding dress, same number and last name as the groom. The base of the cake topper is in the shape of a baseball field with a scoreboard behind the groom and bride that reads Angels Stadium. The score of that proposal day was Angels 5, Dodgers 1, so they would like the same score on the scoreboard and to add the same proposal baseball in front of them.